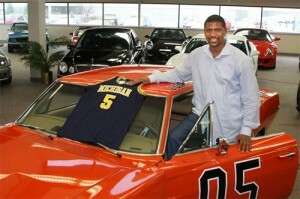 DETROIT – (May 11, 2011) – Beginning May 22, 2011, one of the world’s last surviving 1969 Dodge Chargers from “The Dukes of Hazzard” TV show will be auctioned on eBay Motors with proceeds to benefit the Jalen Rose Leadership Academy (JRLA) in Detroit. Donated from ESPN/ABC studio analyst and 13-year NBA veteran Jalen Rose’s private collection, the vehicle was one of the last four vehicles remaining from the set and was purchased by Rose in 2001. Bids will be accepted for the auction starting at noon on Sunday, May 22, and the auction will run for a 5-day period, concluding at approximately noon on Friday, May 27. It will be a “No Reserve” auction, with a starting bid of $45,000. The iconic “General Lee” vehicle up for auction features a 360ci V-8 crate motor, four-wheel disc brakes, Alpine sound system with trunk mounted sub-woofer, custom embroidered “Charger” floor mats and white letter BFGoodrich Radial T/A tires. The rear decklid is autographed by Rose and John Schneider – who played “Bo Duke” in the original series – with personal messages. Proceeds from the auction are dedicated to benefit JRLA, a new 9-12 college-prep charter high school on the Northwest side of Detroit, established by Rose. Scheduled to open in September 2011, the Academy will enroll 120 ninth grade students this Fall, followed by an additional freshman class each subsequent year, with a total enrollment of 480 students at full capacity after four years. Students will receive a leadership-focused education and will be engaged through individualized learning, prepared to excel on the ACT and challenged to achieve at the rigorous level necessary to earn a college degree by receiving extensive college exposure and course opportunities through a partnership with the University of Detroit Mercy. JRLA is a recipient of a Michigan Future Schools initiative grant, which comes with the expectation that 85% of students graduate from high school, enroll in college, and earn a college degree. Using a grade 9-16 mentor model, the plan at JRLA is to exceed those standards. Applications for incoming freshman are now being accepted at JRLA for the 2011-2012 school year during its open enrollment period through May 31, 2011. JRLA will meet all state and federal requirements for open admission and is tuition-free. Interested families and/or students are encouraged to visit www.JRLADetroit.com for additional information or to download an application.